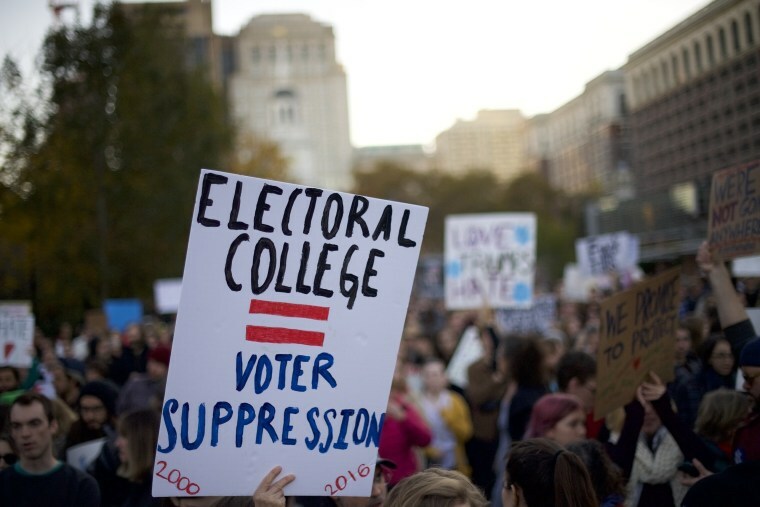 In the seven presidential elections since 1992, the Republican candidate has won the popular vote just once but has prevailed in the Electoral College three times — and the trends show that the Democrats' edge in the popular vote may be growing. When the final tally is in from the 2016 election, Hillary Clinton is likely to win the popular vote by about 2.5 million votes. Donald Trump, of course, won the Electoral College and the White House. Population shifts and changing political divisions in the United States over the past few decades show a definite trend. Since 1992, Democratic White House winners have won the popular vote by an average of 7.1 million votes while Republican White House winners have won the popular vote by an average of 84,000 votes. Behind that split are a few basic facts. Many of the biggest states lean very Democratic and every four years Democrats win those states by very large margins. Look at the six most populous states, all with 20 or more electoral votes: California, Texas, Florida, New York, Pennsylvania and Illinois. Since 1992, Democrats have won California, New York and Illinois by double-digits. Only Texas has been reliably Republican in that time. This year those trends held. Clinton won California by more than 3.4 million votes. She won New York by 1.5 million and Illinois by 915,000. Trump didn’t win any state by the margin Clinton won those three states, but did carry Texas by 815,000 votes. Trump won Florida by about 114,000 votes and Pennsylvania by about 66,000. That’s why Clinton holds a 2.5 million edge in the popular vote but the big margins Clinton ran up in those states don’t carry any more weight in the Electoral College than the smaller wins Trump racked up in Florida and Pennsylvania. One way to understand the popular/electoral split is to look what might be called superfluous votes. All you need to do to win all of a state’s electoral votes is to win that state by one vote. So every vote beyond that one-vote margin carries no real weight in the final Electoral College count. Using this measure, Clinton had more than 10 million superfluous votes that made no difference to her electoral total. Trump had 8.3 million superfluous votes. And that’s despite the fact that Trump won far more states than Clinton — 30 for Trump to 20 (plus the District of Columbia) for Clinton. Add it all up and it suggests that the popular/electoral vote split, which has only happened four times in history, may become a more frequent occurrence in the years ahead. The states that are Democratic strongholds hold big populations and their leftward tilt has been solid for more than two decades now. Furthermore, the larger demographic shifts in those states — they are growing more diverse and have higher-than-average college-education rates — favor Democrats, according to polling data. What changed in 2016 is that some crucial states in the industrial Midwest — Pennsylvania, Wisconsin and Michigan — flipped to the Republicans. Whether those flips are lasting or a one-election aberration is not yet known. But if those states remain tightly contested battlegrounds with a slight GOP lean, then the popular/electoral vote split could become commonplace in the next few presidential races.